In his book, The Trillionist, author Sagan Jeffries exposes the 'who, what, when, where and why' of a boy-genius, turned madman, turned saviour. Spurred on by a darkness residing within his brilliant mind, Sage Rogan, boy-genius and inventor, is relentlessly driven to bring modern advancements to his people. In fearing for his own sanity, he eventually discovers a part of his mind is, in fact, a shadowy ancient spirit with ulterior motives of its own. Realizing that the inventions he’s been coerced into creating could destroy his world, Sage yearns to make things right; clashing with the powerful entity to save his world from annihilation. Rare are stand-alone books backed by a whole and complete cosmology but The Trillionist is one of those. The novel is based on Ed Lukowich’s non-fiction Trillion Years Universe Theory, which states that the Big Bang never happened and that the universe might be older than we think by trillions of years. Sounds crazy? Maybe. 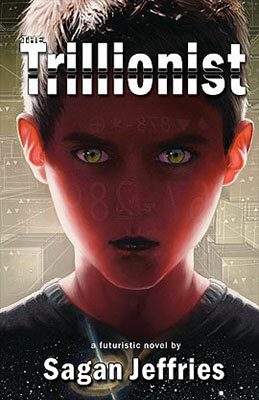 Didn’t read the theory but I got interested in The Trillionist: a “futuristic novel” as mentioned on the book cover. On the planet Tidon, the Rojan family is celebrating the birth of their first son, Sage. Yet his mother Genosa immediately feels something isn’t quite right. The baby keeps crying, never sleeps, stares right at people, appears to be fulminating and even threatening. Very soon, he displays signs of extreme gift: at two, he taught himself to read. At twelve, he’s in high school and very soon he becomes the most famous and most productive inventor on his planet. However, the child remains subject to brutal mood swings and tantrums. Frustration throws him in such rage that his own parents can’t recognize him. They finally turn to a specialist who diagnoses the boy with Multiple Personality Disorder. Although devastated, Sage decides to study and fight his destructive “other self”. The introspection of Sage is the most interesting aspect of The Trillionist. The boy regularly goes into an inner world which feels a bit like a dungeon. He explores it for clues about how to restrain his evil side, but also to understand why he can develop technologies just as if he has always known them. This quest against himself was my favourite part of the book. Unfortunately, I was quite disappointed in some major aspects of the books, all linked to the light-speed development of Sage. First of all, I just couldn’t believe in the technological revolution of Bella Yareo. In less than ten years, Sage brings a country in which “no one has even sailed as far out to sea as the far side of Tidon, so no one knows what’s there” to an all-connected world like ours nowadays. He provides Bella Yareo with new technologies as disparate as computers, wireless telephones, optic fibres, microwave ovens and robots of all kinds. Within ten years. That didn’t work for me: I don’t believe (modern-time) scientific achievements can be made by a sole man. Even if you come up with a fantastic idea, it doesn’t mean you know how to make it happen. And even then, you can only get so much done with your two hands. Also, when it comes to building a spaceship, I would believe it takes quite a bit of engineers just to apply Sage’s plan. Where do you find those engineers on Tidon? It doesn’t mention Sage sharing his knowledge and it doesn’t seem to be in line with his character. The Trillionist seems to infer that money and talent can do everything but how do you build factories and machines, let alone train technicians and engineers in less than ten years, especially when the only man who knows everything doesn’t have a second to spare? Finally, the society of Bella Yareo didn’t make much sense to me. So many life-changing new technologies in so little time should trigger some unrest, to say the least, but everyone seems happy with throwing money into new gadgets and to the same huge trust. Furthermore, the King of Bella Yareo is so passive: he doesn’t seem to be worried about Sage gaining more power and popularity than him, new technologies don’t encourage him to contact (or invade, as kings often do) other lands. He is just so useless! It felt like the story was entirely focused on Sage and the consequence of the boy’s actions on his country was not entirely thought over. All in all, I did like The Trillionist — hence the 3 stars — but I didn’t fully enjoy it. The plot is entertaining but at times, I honestly rolled my eyes at what I believe was an over-simplistic perception of scientific achievements. I also would have preferred if the society of Bella Yareo had been more developed, if only to make the story sounds a bit more realistic.